This volume is a collection of essays by Richard Wolin, a leading political theorist and intellectual historian. It is the follow up to Wolin's two recent, widely acclaimed books: Heidegger's Children and The Seduction of Unreason. In those books, he explored the legacy of Martin Heidegger and his impact on some of his most influential and notable students. He dealt particularly with the effect that Heidegger's subsequent embrace of fascism and National Socialism had on these students. Delving further in his next book, Wolin explored the question of why philosophers and intellectuals have been drawn to antiliberal, antidemocratic fascism. The essays in this book are focused on European Political Thought particularly with figures associated with the Frankfurt School. 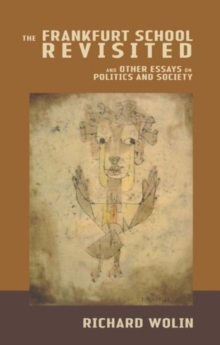 The collection represents a virtual who's who of European political thinkers with essays on Walter Benjamin, Adorno, Marcuse, Arendt, Heidegger, Weber, Jaspers, and Carl Schmitt. Moving beyond these thinkers and those books, this collection will also include essays on contemporary political issues such as post-communist revolutions, human rights, global democracy, the revival of republicanism, and religion and public life.